Life In a Peanut Shell: GO VOLS!! I'm off to the Tennessee vs. Ole Miss football game tomorrow in Oxford, Mississippi! My boyfriend was a player on the U of Tennessee football team several years ago so naturally, he is a die-hard fan! Mississippi is only about an hour from Memphis and we are leaving super early to tailgate. There's nothing like smash mouth SEC football. This rivalry should be great. 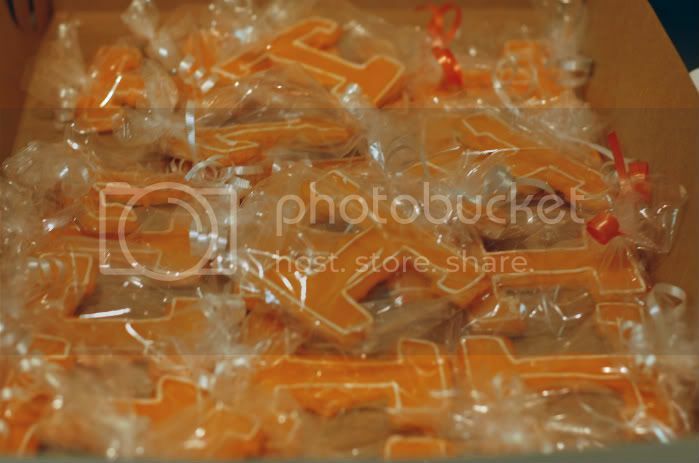 Since the tailgate is consisting of over 100 people, I thought it would be a nice touch to bring Tennessee Volunteer decorated cookies including a football, helmet, and "T" logo. I made about 6 dozens of these today using a basic sugar cookie recipe. All of the cookies were dipped in icing and decorated with royal icing. These were super fun to make and tasted so delicious. I individually wrapped each cookie and topped the baggies off with orange and white ribbon. I hope everyone enjoys them tomorrow at the tailgate! GO VOLS!! so cute! I'm sure they will be a huge hit- have fun! great job ~ that's a lot of cookies!! What a a treat for the party!! Y'all have fun and go team! !